Lisa: Hey there. I’m Lisa Senafe, founder of Bentley’s Pet Stuff. And this is Zoe, one of our many pet experts. Zoe: Are you one of the many pet owners who falls into a routine and feeds your pet the same food day in and day out? If you are, your pet could have nutritional gaps in their diet. Lisa: Can you imagine eating the same food every day? Well neither can I, and neither should our four-legged friends. So we at Bentley’s have developed our mixology feeding guide. Zoe: By using our mixology guide and rotating protein types and food forms, not only is your pet eating a more complete and balanced diet, but it also keeps mealtime exciting for your furry friend. Lisa: Seeing that every pet is unique, a mixology diet should be introduced gradually, as to not disturb your pet’s gastrointestinal system. One way to introduce mixology into your pet’s diet is to slightly reduce the amount of kibble during mealtime, and supplement the calories with a wet food, like canned food, where the main ingredient is a different protein. Zoe: If using a mixology guide like this, gradually introduce the wet food on a daily basis. After a set duration of weeks or months, gradually phase out the kibble and introduce a new kibble where the main ingredient is a different animal protein. Lisa: There are many other food types as well that can be rotated periodically throughout the year, such as dehydrated food, freeze-dried, and simple raw food. Zoe: Each food type brings its own different nutrients, animal protein sources, and textures. 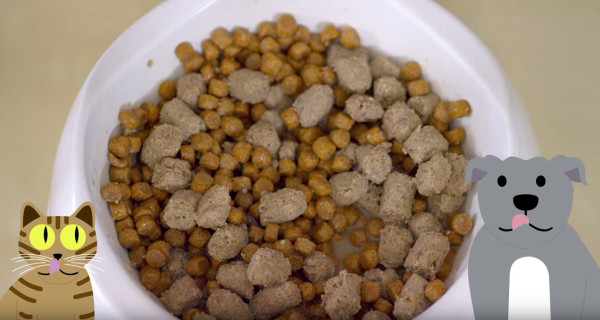 Kibble is the most common source of pet food. It’s simply dried food where, at Bentley’s, meat is the always the first ingredient. Lisa: Canned food is moisture-rich and filled with a mix of all-natural ingredients. This can be a great way to increase hydration in pets. Zoe: Dehydrated food is simply raw ingredients that have had moisture gently removed, preserving the food and nutrients. It’s like home cooking for your pet, but easier. Lisa: Freeze-dried food is raw food that moisture is taken out of. This is raw food that retains its freshness and nutrients with less mess. Zoe: Finally, by rotating raw food into your pet’s diet, they will be closer to their natural diet while eating very nutrient-dense and moisture-rich foods. Lisa: By rotating your food types and protein sources periodically throughout the year, your pet will have a much more well-rounded diet and jump for joy at mealtime. Zoe: Always be sure to check with your veterinarian before beginning a new diet. Lisa: And be sure to ask one of our Bentley’s pet experts the best mixture of foods for your pet’s breed, age, and weight before you start on a new mixology diet. Zoe: Now let’s make mealtime more exciting and nutritious for our furry friends. From all of us here at Bentley’s, thanks for hanging out with us today. Lisa: And as always, don’t forget, at Bentley’s we care about your pets as much as you do. Making pets lives better since 2008, Bentley's Petstuff is the go to place for healthy food for your dogs and cats.